I speak to groups of MBA students regularly and often think of what knowledge I can impart that will help them plan their careers and lives. I found a superbly helpful article in an unlikely place: EOS, Transactions of the American Geophysical Union. The article is: “Shallow Versus Deep Uncertainties in Natural Hazard Assessments.” The authors are very close to me: Prof. Seth Stein, distinguished geophysics professor at Northwestern Univ. and the late Prof. Jerome Stein, former Brown Univ. professor. Jerry is my wife’s uncle and Seth is her cousin. Jerry passed away recently, and this article in EOS, written with his son Seth, is one of his last publications. Jerry was a highly productive scholar to the end, and his last book * showed how America’s Central Bank, The Fed, could have avoided the disastrous financial collapse of 2008-11. Jerry and I agreed that former Fed chief Alan Greenspan bears much of the blame for that collapse. The article is about why scientists find it so hard to assess the risk of natural hazards, like earthquakes. (Italian scientists were recently prosecuted for failing to forecast an earthquake there). Here is the gist of the argument. If you recall your college statistics, the chances an event will occur can be modeled, or simulated, with a jar of colored balls. Red balls signify an earthquake. Black balls signify no earthquake. If the chance of an earthquake is, say, one in one hundred, put 99 black balls and one red ball into an urn and then draw a ball. This is simple. All scientists need to do to assess natural hazards is to figure out how many red balls and how many black balls are in the urn. But – wait! Not so fast. What if the probabilities are changing? What if an earthquake last year changes the probability of an earthquake next year? What if the probabilities are changing over time? (Some earthquakes relieve underground pressure caused by shifting tectonic plates and reduce the probability of future earthquakes; other earthquakes signify that a series of shocks will occur, as the plates shift, and increase the probability). To use our “earthquake predicting urn”, we need to change the mixture of red and black balls. We need to put some balls back after we draw them. But – how many? Do we add more red balls? More black balls? In the diagram above, the flat green line shows a risk, or hazard whose probability is constant. All we need to do is figure out what that number is: 1%, 2%, 5%? That in itself is tough. But suppose the risk is changing over time. Does it look like, say, the craggy red line, which has an upward trend line around random fluctuations? Or does it look like the craggy blue line, which has a constant probability fluctuating randomly around the trend line? 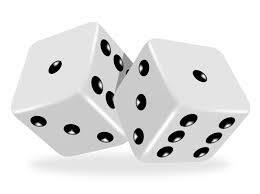 Sometimes dice are used to reflect uncertainty. But it’s far worse than that. Because in life, the number of dots on the dice are constantly changing and we’re not really sure how or when. The red and blue lines reflect what Stein & Stein call “deep uncertainty”. It is deep, because, a) we have great difficulty estimating the risk, or probability, of the event itself, and b) we have to understand whether the risk is changing over time, whether the event influences future events, and if so, how and how much. Combining a) and b) means we have double uncertainty. Climate change, note the authors, is an example of deep uncertainty. What does this deep uncertainty mean for policy makers? If we use standard risk assessment models, that assume constant risks (like the green line), when the risks change with time, we are using wrong models. Deep uncertainties cannot be assessed by estimating probabilities. Those probabilities are moving targets and we’re not sure how or where they’re moving. Assuming expert knowledge when it does not truly exist is a recipe for disaster. It is perhaps why economists are such disastrous forecasters, because they pretend to foresee the future with accuracy. They are using fixed dice, instead of ones with changing dots. As the editor of EOS writes, “in a world where models are becoming increasingly complex, where calculations involve supercomputers and terabytes of data, the Steins’ model gives you x-ray vision into the black box of hazard assessments”. Economists pretend the black box that is our economy is transparent. It’s not. It’s black. Jerry’s book uses stochastic optimal control, a powerful mathematical tool used to guide rockets. Each millisecond, rockets’ optimal trajectory must be recalculated, because of unforeseen forces that buffet it and push it off course, even slightly. This is how we should have run our monetary policy, Stein notes; if we had, we would have seen danger signals long before 2008. This is how we should run our lives, I believe. Recalculate your trajectory frequently, because unexpected forces are always buffeting our plans. A wonderful Yiddish saying goes, a mentsch tracht, und Got lacht… A man plans, and God laughs. What does this deep uncertainty mean for my MBA students? All of us, especially young people, face deep uncertainty in our personal lives. All the skills and knowledge we are acquiring can become obsolete in the blink of an eye. Once a whole layer of managers crunched data. Today they’re gone; software does it instead. What this means for MBA students is this: You need to develop above all two key qualities: flexibility, and resilience. Flexibility, to adapt to rapid unexpected changes and respond to them wisely. Resilience, to take a blow and bounce back, when a sudden ‘hazard’ materializes and causes you financial and professional harm. These are qualities and skills that can be learned, developed, and practiced. But no MBA program I know teaches them. In a world of deep uncertainty, the world Stein and Stein describe, those with flexibility and resilience will endure and prevail. Thanks to Seth, a geophysicist, and the late Jerry, an economist, for making this so clear. I dedicate this blog to Jerry’s memory. * Jerome L. Stein. Stochastic Optimal Control and the U.S. Financial Debt Crisis. Springer: New York, 2012, 157 pages. You say that resiliency and flexibility are not taught, but can be. How can they be learned? How could they be taught? Flexibility is taught, simply by telling kids, even very young ones, that there are millions of ways to do something, not one single RIGHT way (as teachers insist), and that they should try them…a key creativity test gives kids a fire truck and asks them to improve it. One child suggested 25 ways..in minutes! That child went on to become a top entrepreneur. Creativity, after all, is widening the range of choices. Starting in kindergarten, we seem to NARROW the range of choices. Resilience is a bit harder. It is taught by giving kids really hard things to tackle, and encouraging them to stick to it until they succeed. Americans are notorious for trying to avoid any sort of frustration and for shunning any possibility of failure, lest it damage little kids’ psyches. We need to teach our kids to fail, not to succeed, because that’s how you learn; that was Edison’s secret, he failed 10,000 times in developing a filament for the electric light. Israelis are creative in part because life here in the Mideast teaches you both flexibility and resilience, in order to survive. Great to her from you Lionel! « Helping Others: It’s In Our Genes!